As a member of the Chick-Fil-A Moms 2015-2016 Panel, we get awesome insider info and fun activities. 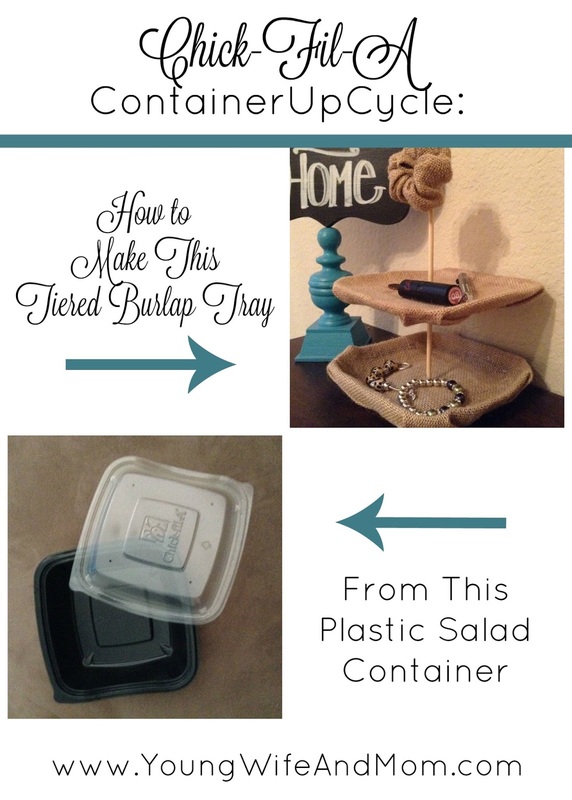 Recently we were challenged with transforming salad containers into something else. 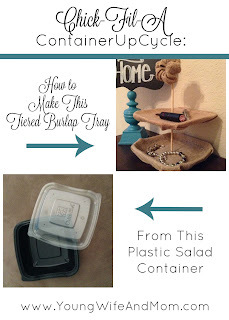 Step 1: Wash your containers and dry well. Step 2: Trim off the lip of the containers to your liking. I went almost all the way down on the clear tray and halfway down on the black tray. If you find your edges too sharp melt down slightly with a lighter or some other heat source. Step 3: Make your dowel holes and cover the trays with burlap, securing with adhesive as you go. I used a smaller dowel but a thicker one is better. Step 4: Add the trays to the dowels and secure with adhesive. I put hot glue above and under the tray for added strength. I hope you enjoyed this post. Check out the other panel members' creations by searching for our hashtag #chickfilamomsDIY.